Connecticut Coast and Country’s unique character is full of interesting history, local legends, natural features, and other highlights. Even if you have lived in this area for many years, there are always fascinating new stories to discover. We hope that these facts about eastern Connecticut and southwestern Rhode Island will give you a deeper appreciation for the region and encourage you to explore the little-known treasures in this corner of the world. While on a whaling expedition in the Arctic in 1855, Captain George Buddington and the crew of the George Henry spotted an eerie site: the deserted British ship HMS Resolute, adrift near Baffin Island. The Resolute had formed part of a search party to locate Sir John Franklin and the 128 men under his command, who had gone missing while looking for the Northwest Passage. The crew of the Resolute abandoned her after she became trapped in pack ice. The George Henry had stumbled upon the vessel about a year later, nearly 1,200 miles from her last known location. Buddington ordered some of his crew to board the Resolute, and she was sailed back to New London. As a gesture of goodwill to the British government, the United States repaired the ship and sailed it to England to present to Queen Victoria. The gesture played an instrumental part in repairing the frayed relationship between the nations. When the Resolute was broken up in 1879, the British government showed its appreciation for the ship’s rescue by giving a desk made from its timbers to President Rutherford B. Hayes. The desk has remained in the White House ever since. Noank served as the backdrop to Amelia Earhart’s wedding when the aviator married publisher George P. Putnam on Feb. 7, 1931. The secret ceremony took place in the home of Putnam’s mother. The betrothal took five minutes. Reporters flooded into the village upon hearing the news, only to find that the couple had already departed. Earhart went on to make several pioneering flights, becoming the first woman to make a solo transatlantic flight and the first person to fly solo from Hawaii to California. She disappeared over the Pacific, along with navigator Fred Noonan, while attempting an around-the-world flight in 1937. Roger Griswold was born in Lyme, and in 1794 he was elected to the U.S. House of Representatives. Four years later, he would be involved in a bizarre brawl with another congressman. When Representative Matthew Lyon of Vermont accused the Connecticut congressmen of failing to represent their constituents, Griswold retaliated by insulting Lyon’s record in the Revolutionary War. Lyon, in turn, spat tobacco juice in Griswold’s face. A Feb. 14, 1798 vote to expel Lyon for “gross indecency” was unsuccessful. One day later, Griswold took matters into his own hands by attacking Lyon with his walking stick on the floor of Congress. Lyon grabbed a pair of fireplace tongs and fought back until the two men were separated. The House debated whether to expel both Lyon and Griswold, but ultimately took no action. Griswold remained in Congress until 1805, served as lieutenant governor of Connecticut from 1809 to 1811, and was governor of the state from 1811 until his death the next year. Edwin Herbert Land, inventor of the Polaroid instant camera, got his inspiration while attending a boy’s camp in Lebanon. Growing up in Norwich, he attended Camp Mooween at the age of 13. There, counselor Barney Girden showed the boys how a Nicol prism could remove the glare from a tabletop. Land grew increasingly fascinated with such methods of polarization. At first, he focused on using the technique to improve automobile headlights, but later applied it to other areas. Polaroid became a household name after Land developed the instant camera in 1948, allowing photos to be quickly developed. In his life, Land patented 535 inventions. Camp Moween has since been converted into a state park. Charles Lindbergh crossed the Thames River between New London and Norwich. Lindbergh’s successful journey in the Spirit of St. Louis made him the first person to make a solo transatlantic flight. Although lesser known today, the subsequent transatlantic flight of the Columbia also took a similar route. This plane traveled from New York to Germany, breaking Lindbergh’s distance record by more than 300 miles. Although the Columbia’s flight path was to head directly over New London, a faulty compass caused it to miss the city by 10 miles. Smith & Wesson, the famous firearms manufacturer, got its start in Norwich. Horace Smith and Daniel Wesson were natives of the city, and in 1852 they founded the Smith & Wesson Company there. The initial focus of the company was the “Volcanic” repeating rifle. This first company did not prove successful, and the partners soon had to sell it to Oliver Winchester – a shirt manufacturer who later developed a famous rifle of his own. Smith & Wesson’s second partnership, in 1856, established a successful revolver company in Springfield, Massachusetts. Smith & Wesson wasn’t the only firearms manufacturer in Norwich. More than 20 companies set up shop in the city in the 19th century, producing thousands of weapons for the Civil War. Eastern Connecticut isn’t known for its seismic activity, earthquakes are occasionally felt in the region. There are even two prominent examples of plate tectonics here. In East Haddam, the village of Moodus derives from the Indian name of Machimoodus, or “place of noises.” Audible rumblings in this area are a result of frequent microquakes, centered around Cave Hill. The sounds inspired rumors of evil spirits in the area, and served as the basis of an H.P. Lovecraft tale. The state’s strongest earthquake, which occurred in 1791 and is thought to have been about 4.3 on the Richter scale, had its epicenter in Moodus. Several ancient faults exist in the region as a result of the breakup of the supercontinent Pangea and the formation of the current continents. The Lake Char Fault—short for Lake Char¬gogg¬a¬gogg¬man¬chaugg¬a¬gogg¬chau¬bun¬a¬gung¬a¬maugg—runs roughly parallel to I-395. Evidence of the fault is particularly noticeable in the village of Wilsonville in Thompson. Two sites in eastern Connecticut were early adopters of electricity for both rural and industrial purposes. Fairy Lake Farm in Salem was the first rural electrification project in the United States. Frederick C. Rawolle, Jr., built a hydroelectric dam at his homestead and used the power to run a refrigerator, washing machine, and other electric devices. The 1922 development predated the installation of power lines in the neighborhood by 25 years. In Willimantic, the American Thread Company experimented with electric lighting at one of its mills. The successful use of this illumination led the company to incorporate it into its Mill No. 4, built in 1880. This was the first mill building in the world to be designed for electric lights. 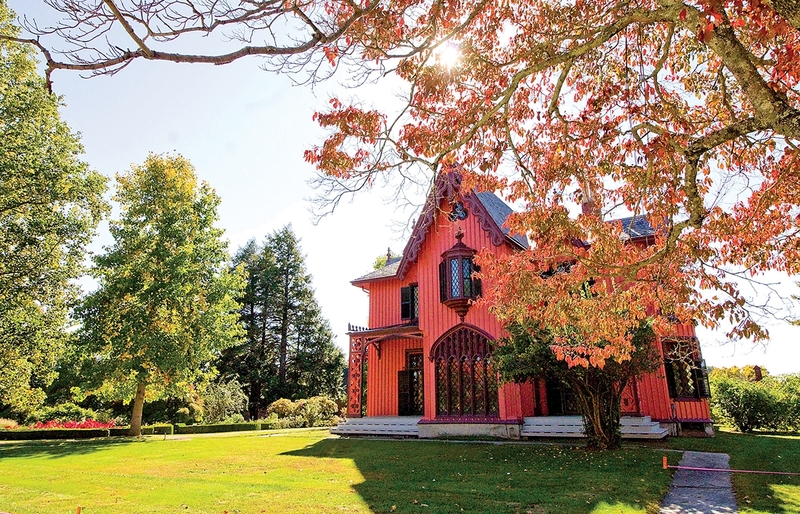 Roseland Cottage, the striking Gothic Revival mansion owned by businessman Henry C. Bowen, became renowned for its enormous Independence Day celebrations. The annual party began in 1870 and continued for 25 years, attracting thousands of visitors. Many prominent guests flocked to Bowen’s home for the festivities, including several U.S. Presidents. oldest surviving indoor bowling alley. After attending the first Independence Day party in 1870, President Ulysses S. Grant visited the alley and bowled his first strike. Two eastern Connecticut communities would have had different names had the state legislature not ignored the requests of their residents. When the residents of the northern part of Stonington decided to form their own town in 1807, they wanted to name their community Jefferson, after the former President. While the General Assembly approved the new town, they denied the preferred name. The legislature said that since the identity of North Stonington had already been associated with institutions such as the local school, it was easier to adopt this name. Hidden alongside the Quinebaug River in Lisbon, the Taft Tunnel is one of the longest serving railroad tunnels in the United States. The 300-foot portal, carved out with picks and shovels, opened in August 1837 as part of the Norwich & Worcester Railroad. The Taft Tunnel is sometimes claimed as the first railroad tunnel in the country, although that honor goes to the disused Staple Bend Tunnel in Pennsylvania. However, the Lisbon site is considered the oldest active tunnel in the U.S. It still brings trains through the hillside as part of the Providence & Worcester Railroad. Israel Putnam was one of the most prominent Connecticut figures in the Revolutionary War. Leaving behind his farm in Brooklyn, he helped raise militia members from Connecticut and served as a major general at the Battle of Bunker Hill. He later took part in the defense of New York City. After Putnam died in 1790, his grave became a popular tourist attraction. Unfortunately, many of these visitors chipped away pieces of the Putnam’s gravestone to take home as keepsakes. In 1888, a sculptor was commissioned to create a tomb for Putnam in the center of Brooklyn, topped with a massive equestrian statue. Putnam’s remains were transferred here, while his original gravestone is now on display in the state capitol. Rhode Island briefly served as a space center in 1999, when Charlestown hosted a rocket launch. NASA helped fund and organize the launch of a Loki/Viper rocket to collect dust particles from the tail of Comet Tempel-Tuttle. More than 5,000 people attended the launch, which took place near the Frosty Drew Nature Center & Observatory in the Ninigret National Wildlife Refuge. The suborbital rocket reached a speed of Mach 5 and a height of 20 miles, while the payload was propelled 56 miles above Earth. The lower stage of the rocket was dredged up by fishermen two years after the launch and is currently on display at the observatory. Unfortunately, the payload was never recovered since the Coast Guard vessel assigned to this task had to respond to a boater in distress. During the Revolutionary War, a French army marched through the region on its way to helping the United States win the conclusive Battle of Yorktown. The Comte de Rochambeau arrived in Rhode Island in July 1780 with 450 officers and 5,300 men. He met with George Washington in Hartford, and the commanders decided that they would not be able to attack any British strongholds that year. While most of the army spent the winter in Newport, the cavalry division hunkered down in Lebanon. In the summer of 1781, Rochambeau’s army traveled through Connecticut to rendezvous with Washington’s troops in New York. The march took them through several towns in the region, including Plainfield, Canterbury, Scotland, and Windham. Surviving portions of this route have been listed on the National Register of Historic Places. Once Rochambeau and Washington’s armies combined, they marched south to Virginia and forced the surrender of General Cornwallis and his soldiers. French troops traveled along roughly the same route while returning from this battle. To learn more about the fascinating people who have shaped local and national history and culture, download the Historic Houses Museum guide from historichousesct.com. Walk the rooms where wounded soldiers were treated after a Revolutionary War battle at the Ebenezer Avery House. See the gorgeous riverside property where American Impressionism began at the Florence Griswold House. Explore the life of a famed sea captain at the Capt. Nathaniel Palmer House. The guide covers 16 historic house museums in the southeastern corner of our state, and spans “the agricultural beginnings of Colonial Connecticut through the development of communities, the American Revolution, the Civil War, and the transformative effects of industrialization.” And if that stirs your interest, ctlandmarks.org details remarkable properties in the northern and central part of the state, including the birthplace of Connecticut’s State Hero, Nathan Hale, who was hanged as a spy during the Revolutionary War. The house, built in 1776, belonged to Nathan’s parents and family, and is located on the only site he ever called home. Its expansive grounds also host the Coventry Regional Farmers Market, Sundays from June to October.